Web Log Storming is an interactive, desktop-based web log analyzer for Windows. A whole new concept of website statistics makes it clearly different from any other web log analytics software. 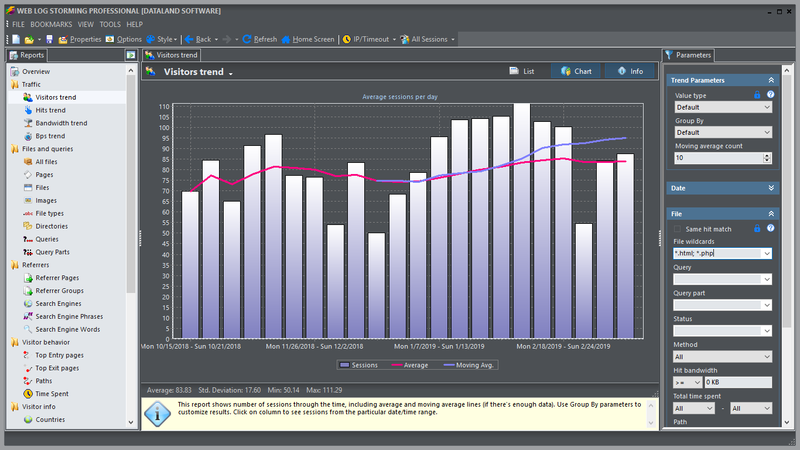 Browse through stats to drill down into details - down to an individual visitor's session. Check the pattern of individual visitor behavior and how it fits into your goals. Use on-the-fly filters (parameters) to easily and quickly focus on a specific segment. There are no limitations: combine any report with any filter to learn about advertising effectiveness or behavior patterns. Simply click on any report item to view a list of sessions related to this item. Click on any session to view all details: IP address, domain, country, region, city, referrer, user agent, visited pages, search phrase, etc. Web Log Storming does far more than just generate common reports. It displays detailed web site statistics with interactive graphs and reports. Complete and detailed log analysis of activity from every visitor to your web site is only a mouse-click away. With this website statistics software, it's easy to track sessions, hits, page views, downloads, or whatever metric is most important to each user. You can look at referring pages and see which search engines and keywords were used to bring visitors to the site. Web site behavior, from the top entry and exit pages, to the paths that users follow, can be analyzed. You can learn which countries your visitors come from, and which operating systems and browsers they use. You'll learn how your bandwidth is being used, and how much time users spend on your site. You can tell how popular your files, images, directories, and queries are. In other words, analyze your web logs like never before!